Ever since they broke into the espresso machine scene in 2001, this Australian company has given its traditional Italian competitors a run for their money. But with such a wide range of products, it can be hard to find the Breville that’s right for your brewing needs. But fear not. We’ve got you covered with a complete breakdown of the best Breville Espresso Machines. Founded in 1932, Breville has become a household name in Australia and their espresso machines top most aspiring at-home baristas’ wish lists. They are best known for their innovation and customer-company communication, often incorporating feedback from their users in their designs. They got their start making radios during WWII and other home appliances later. Their big break came in the form of a sandwich toaster, and they eventually entered into the espresso machine market in the early 2000s. Since then, at-home espresso brewing has been all the better. 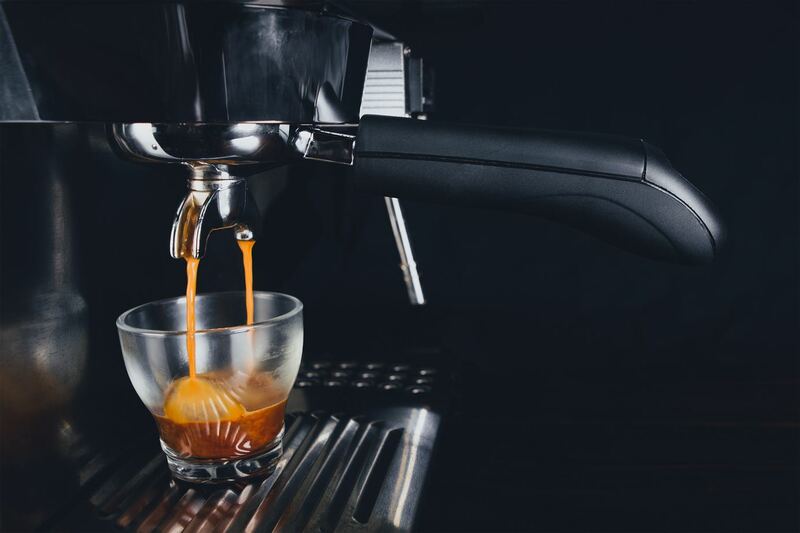 As a result of their dedication to their customers, their line-up of espresso machines is impressively wide, and their products tend to be functional and user-friendly from top to bottom. Outside of their home base in Australia, Breville’s production presence has extended to Canada, Hong Kong, New Zealand, and the United States. All Breville products come with a one year limited warranty. So if your machine is defective or breaks a little too soon, they’ve got you covered. Like we mentioned earlier, Breville’s customer-company communication is impeccible. That extends to day-to-day customer service as well. They have representatives available every day to address any questions you might have. As a result of listening to their customers, Breville’s machines and manuals are impressively easy to use and understand. That means you should be able to get a hang of things pretty quickly, whether you’re a professional or a total novice. Most Breville products include PID (Proportional-Intrgral- Derivative) Control technology, which manages extraction temperature to minimize fluctuation. This means your shot will be pulled within the optimal temperature range, making for consistently excellent espresso. One of the most distinguishable attributes of Breville appliances is their distinct stainless steel facade. But this top-notch build material is more than surface deep. It’s the primary material for most of their machines from high to low end. This feature means their products are easy to clean and durable, perfect for any kitchen. According to Breville’s philosophy on cafe-quality brewing, one of the main culprits for mediocre home-brew is insufficient dosing. Most automatic machines use 11-13 grams of grounds; whereas Breville machines use 19-22. This makes for a richer, more full-bodied espresso that rivals (and maybe even surpasses) the cups you can get at your favorite cafe. If you’re just looking for a quick recommendation, the Breville Barista Express is generally our number one pick. For a reasonable mid-range price, you get all the flexibility of a semi-automatic machine with luxury to rival some higher-end options. Like we said, this is a semi-automatic machine. But, don’t be intimidated if you’re new to the espresso machine scene, as this one is actually pretty user friendly. Plus, it has a little bit of automatic functionality, including a stainless steel conical burr grinder and some programmable settings. On the outside, you can get models in the classic stainless steel (which we recommend), red, and black. It has a sleek, simple interface that’s pretty easy to catch onto. Inside, there’s a 1600W thermocoil heating system and a 15 bar pump. That means you’ll get consistently excellent espresso in about 2 to 4 minutes. It also features a 2L water tank, built-in water filtration system, purge function, 1/2 lb sealed bean hopper, automatic steam wand (with manual option), and low-pressure pre-infusion option. The only drawback to this machine is the volume. The grind and brew cycles can be a little noisy, which isn’t ideal for early mornings with light sleepers. But as far as the usability and end result go, this is a great option. Not jazzed about the idea of a semi-automatic, don’t worry. If you have a larger budget, you can opt for full show with the Barista Touch. While we typically recommend semi-automatics for home baristas who want to hone their brewing skills and experiment with their espresso, that’s not everyone’s style. If you’re looking for a top of the line Breville machine, the Barista Touch is a great choice to just set and forget. Plus it isn’t all the way at the top of the price range. The LED touch screen allows you to customize your cup by selecting grind, brew, and milk to adapt the strength, texture, and temperature to your tastes. You can then save up to 8 of these unique choice combinations. But if you don’t where to start with these customization options, it has 5 pre-programmed coffee options for you to start with. The steam wand is automatic and features options for adjusting the milk temperature and texture to get the ideal micro-foam. The Barista Touch also has an integrated conical burr grinder. Like the Express, this model has a 1/2 lb bean hopper and 2L water tank capacity. On the down side, if you opt for this machine instead of the more expensive Oracle option, you have to tamp your own grounds. And even though it’s about half the price of the Oracle Touch, the price is still pretty steep, coming in close the the Dual Boiler model. If you’re really aiming for professional tasting results, you should consider Breville’s Dual-Boiler model. This is another semi-automatic machine, meaning it comes with a little bit more of a learning curve than the Barista Touch. However, you will get to be more involved in the brewing process. The namesake dual boilers independently control both the brew and steam temperatures. That means you can get top-notch espresso in less than 5 minutes. The PID temperature control paired with the stainless steel housing allows you to limit extraction temperature to give you a smooth cup without sacrificing the distinct oils of your grounds. The Dual-Boiler model also features an LCD display, shot clock, dedicated water spout (for tea or Americanos), and an over-pressure valve. Basically, you get the ultimate control over your brew. While we would definitely suggest that experienced baristas take a look at this machine, it may not be an ideal choice for beginners. Also, the price is pretty steep, especially if it’s your first espresso machine. If you’re on the market for a semi-automatic machine without all the bells and whistles of the Barista Express, check out the Infuser. As the name suggests, the selling point of this machine is the pre-infusion cycle, which isn’t a super common find on semi-automatic machines. It slowly introduces low water pressure to your grounds to allow them to expand before increasing the pressure and extracting your espresso. As a result, you are really getting the most out of your espresso beans with this machine. That said, because this machine doesn’t have a built-in grinder, you’ll need to make sure you have one. Otherwise, you won’t be getting your money’s worth out of the flavor of your brews. It has limited but sufficient temperature control, a 1650W heating element, purge control, a manual micro-foam milk texturizing system, single and dual wall water baskets, auto-sleep functionality, and volumetric controls. All of which allow you to pull a great shot. The main drawbacks for this machine are the noise and accessories. The brew cycle can get a little loud, and you will likely need to purchase a quality burr grinder to get the most out of this machine. The Duo-Temp Pro is a simple but functional machine at a more affordable price point on the Breville line-up. This model is another semi-automatic option, which means you get to manually control the volume of your shot. It’s designed to allow you to pull one or two shots at a time and features a 15 bar pump with a low pressure setting for pre-infusion. The Duo-Temp pro includes 1- or 2- cup single or dual wall filter baskets, which accommodate both the number of shots your pulling and the type of grounds you’re using. It also has a steam wand for frothing milk for specialty drinks. Additionally, you’ll find a precise 1600W heating system, 1.8L water tank, and a purge function in this machine. In all, it’s a pretty straightforward semi-automatic for a reasonable price. Some users have complained about the auto-timer prematurely shutting off the machine; however, the issue seems to be both minor and intermittent. It may also be a tad on the noisy side. If you’re really looking to save some money, but you still want the quality craftsmanship of Breville, the Cafe Roma may be for you. 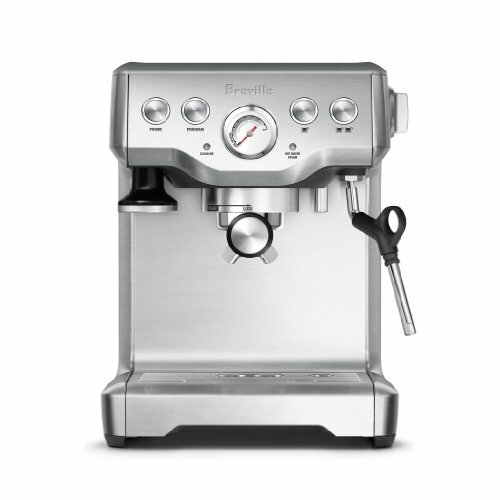 The Cafe Roma is at the bottom end of the Breville price-range. However, it still includes all the necessary components to pull a good shot of espresso. 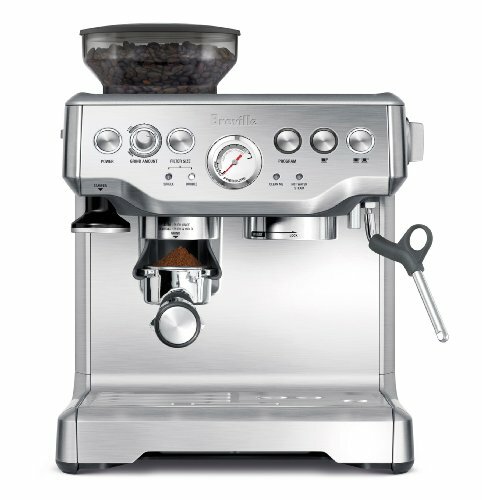 Even though it’s relatively affordably priced, this semi-auto machine still features the sleek stainless steel design of other Breville machines. Meaning it’s pretty durable when compared to other products in this price range. It features a sizable 1.2L water reservoir and a 15-bar pressure pump. It also has a dual-walled filtration system and a decent steam wand. As can be expected with a lower-price machine, there are a few drawbacks. The main one is that the brewing is not quite as hot, which can affect the resulting flavor of your espresso. If this is a problem for you, try using a darker roast to compensate. This list would be incomplete without including one of the machines Breville produces in partnership with Nespresso. The Creatista Plus is the best example of the marriage of these two brands. 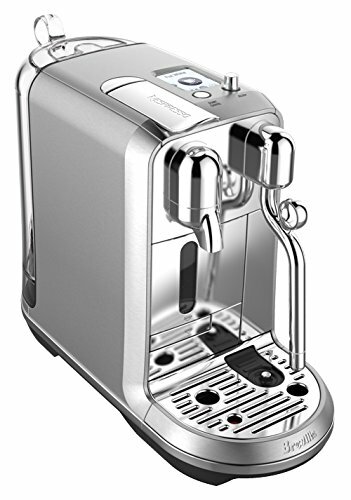 While this machine is Nespresso compatible, it clearly looks like a Breville machine, with the sleek, stainless steel design. It also stands out as it has a built in steaming wand, the first of its kind in the Nespresso line-up. It has 8 coffee options, 4 froth levels, and 11 temperature settings That makes this one of the most customizable pod brewing systems (though it doesn’t really rival most standard espresso machines). All of these options are accessible from a LCD display. 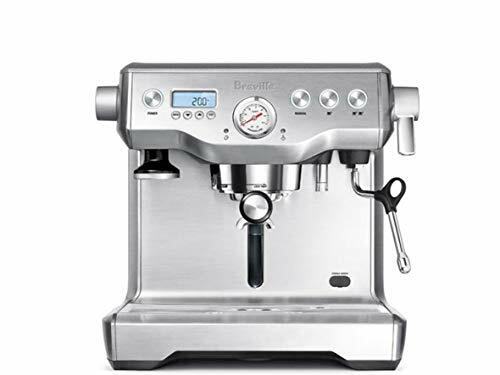 So if you’re looking for a midway point between a solid, traditional espresso machine and a convenient capsule brewer, this Breville should definitely make your short list. On the down side, this machine’s espresso isn’t going to be quite up to par with non-Nespresso options. Also, the other inherent drawbacks of capsule brewing should be considered (less ground options and less flexibility). It’s also at a higher price than other pod-brewing systems, due to the increased functionality. So there you have it! 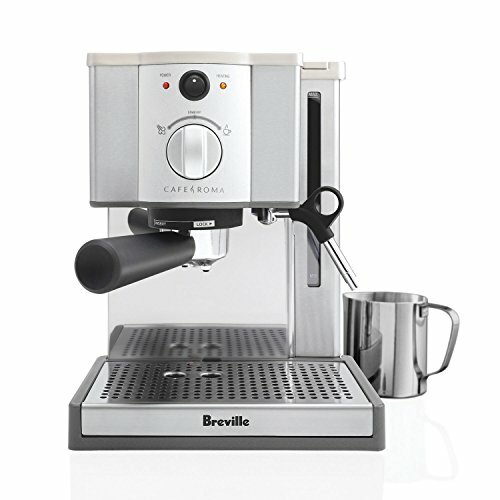 The best machines of one of the espresso world’s top brands, Breville. 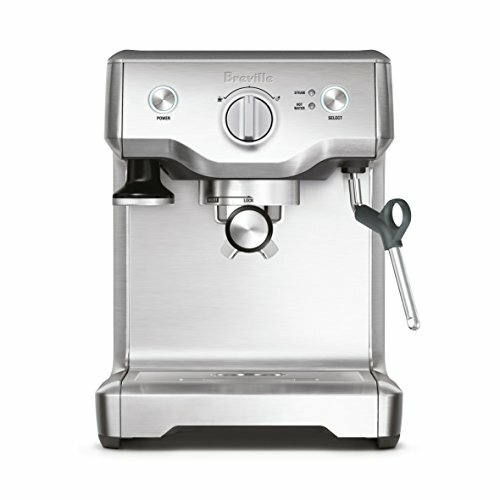 If you are just looking for a quick top pick, check out the Breville Barista Express. But if you have a bit more time, take into consideration your budget, automation needs, and accessories. If you want top of the line super-auto capabilities, consider the Barista Touch. Want something with professional flexibility? Perhaps the Dual-Boiler is for you. Or if you are looking for a lower price-point, the Cafe Roma could be your best bet. Maybe you’re on the market for a pod-brewer, in which case you might go for the Creatista Plus. Whatever your brewing needs, Breville undoubtedly has you covered.